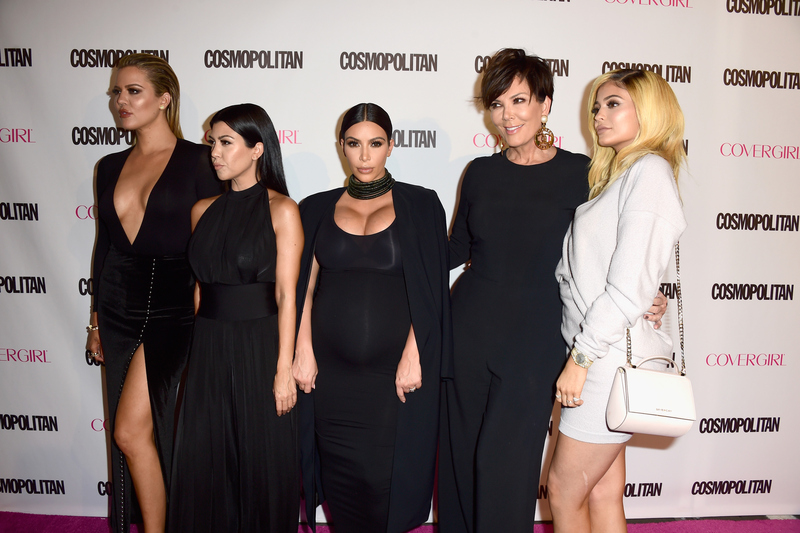 So just in case you haven't been keeping up with the Kardashians lately, Kris Jenner turned 60 years old on Nov. 5, and her family celebrated in typical, star-studded fashion. The world-famous momager, businesswoman, and reality TV star had an extravagant Gatsby -themed birthday party to celebrate her latest milestone with all of her friends and family, and it included an epic birthday tribute video to Jenner, made by her Kardashian/Jenner daughters. What better way to spread the icing on the birthday cake than with the best throwback video ever? I'll have to admit, even being the Kardashian lover that I am, when I first heard about Jenner's video, I was a little skeptical. "Kris Jenner" and "music video" are words that I don't usually put in the same sentence. To be honest, I was expecting something along the lines of Kim Kardashian West's music video stint for "Turn It Up" – aka, not good. However, if you don't give this video a watch, you are making a big mistake. While at the party, Jenner's kids — Kourtney Kardashian, Kim Kardashian West, Khloe Kardashian, Kendall Jenner, and Kylie Jenner (Rob Kardashian seemed not to be involved) premiered an adorable music video for their mom that they had made, and it was a combination of a reincarnation of Kris Jenner's 30th birthday music video (more on that soon), and a new, "remastered" version of the clip featuring all of her family and friends. Not sure if you can afford to make the seven minute commitment to the latest Kardashian/Jenner masterpiece? Not to fear! After much deliberation, I have stripped down the video, narrowed down the clips, and created a mini highlight reel of the best moments from the already-iconic tribute to Jenner. In this clip from Jenner's old (and yes, real) music video called "I Love My Friends," it's clear that the future Keeping Up With the Kardashians star is the queen of multi-tasking. Singing while working out is the best cardio! Netflix and chill? No way! Champagne showers and bubble baths is where it's at. Kim K, Khloe, and Kourtney were the most adorable trio! The tree girls shouting "they love you" is probably the cutest thing you will see all day. In the part of the video dedicated to recreating "I Love My Friends," Kendall and Kylie Jenner teamed up with their eldest sister Kourtney Kardashian to show that they have what it takes to imitate their mom. They can work out and sing at the same time just as well as Mama Jenner. No music video is complete without Justin Bieber. The longtime family friend, along with Jenner's boyfriend Corey Gamble, teamed up to tell the birthday girl how much they love her. Katy Perry let it all out in her tribute to Kris Jenner, letting everyone know that no matter how old Jenner got, it didn't matter, because she is just as fierce and fabulous as a woman half her age. Is it really your birthday if Kanye West and Kim K don't say that "they love you?" As if these kids weren't adorable enough already! North West, Mason, Penelope, and Reign Disick made up my favorite celeb appearance in this whole video, if I'm being real. Imitation will always be the sincerest form of flattery. It's nice to see that Caitlyn and Kris are on good enough terms to take part in jokes like this and share messages of love. No one does birthdays bigger and better than the Kardashian/Jenner clan, and it would only make sense for the head of the family to have the most elaborate extravaganza. Kris Jenner, you have outdone yourself once again.